Home › Abundant Living › Seek What First? In Matthew 6, Christ tells the crowd of people to not be anxious for food, drink and clothing, but rather “seek first his kingdom and his righteousness, and all these things shall be yours as well.” Sounds pretty good. Actually it’s quite a profound statement. Most people didn’t know what Jesus was talking about. Sounds like if we look heavenly (whatever that means) and be loving and good (like Jesus), then we’ll get basic essentials for living (food, drink and clothing) and other unnamed benefits as well. If we look around us, as I’m sure people in Christ’s time did, this statement is actually not believable. After all, we all know religious and good people who never got out of poverty and life struggles. Jesus, as God, knows the needs of His human creation. He knows our selfish hearts. We put our physical basic needs, wants, desires and even aspirations before spiritual things. Our great concern in life is often not the kingdom of God, but seeking a happy life. Oswald Chambers names Jesus’ call to seek first the kingdom of God the “most revolutionary statement human ears every listened to.” He’s right. How very profound that Jesus wants us to get rightly related to God first, maintain that as the great care of life, and never put the concern of your care on the other things. Not necessarily in this life. Don’t be deceived. The Bible states: And we know that in all things God works for the good of those who love them, who have been called according to his purpose. – Romans 8:28. Just because we now love and follow God does not equate to earthly prosperity and freedom from want and need. Rather, we are free to live in full peace regardless of our earthly circumstances. Do what we can but remember our #1. His good purpose reigns but it’s not always evident to us or anyone in this lifetime. Nevertheless we can rest in full peace in the love and spiritual largesse of our good Father. 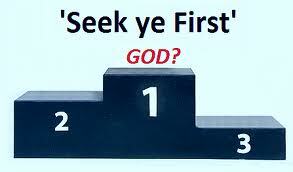 Are you truly seeking first the kingdom of God?